Requires manual PunkBuster update to play on protected servers. Planet Call of Duty - Very old hub for all Call of Duty games. Has mods, guides, and news on the Call of Duty communities. Hasn't been updated for a while. SafeDisc v4 DRM[Note 1], CD-ROM edition with 6 discs and a DVD-ROM version. The USA retail edition is a 6 CD ROM Disks, the Europe retail edition is a DVD ROM Disk. There are 3 ways to insert commands. 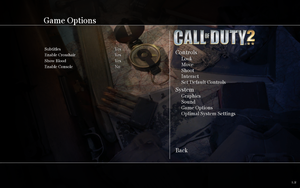 Enable console in the "Game Options". Type command and press ↵ Enter. If commands aren't sticking try putting "seta" before them. If you are in the multiplayer part of the game, you need to place a common slash / before the commands. config.cfg contains single player settings. Set resolutions above 2715x1527 ingame if you encouter a crash to desktop. On/Off toggle in "Look" settings. Can be further adjusted with cl_mouseAccel parameter. EAX 1.0, 2.0, 3.0; A3D 1.0 and 2.0 can be forced with mss_3d_provider Aureal A3D 2.0 (TM) or mss_3d_provider Aureal A3D Interactive (TM) and snd_restart commands. Only available in China Mainland (People's Republic of China) retail release. Only available in Taiwan (Republic of China) retail release. Only available in Portuguese retail release. Use unofficial Slovak language file (Windows). Also contains localized textures and videos. Only available in Thai retail release. Use the Indonesian Subtitles mod. 64 Requires manual PunkBuster update for protected servers. Turn Steam overlay off in properties. Turn off any program that overlays a GUI in the game (teamspeak GUI overlay) etc. Turn on stereo mix under recording tab in sound properties. 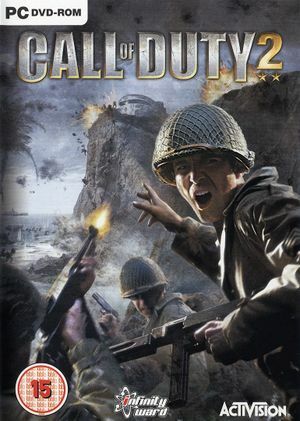 The fix is to force the CoD2 exe file to only use one processor core, but that doesn't mean the problem is exclusive to multicore processors; the same thing happens even on a Pentium 4 with Hyperthreading. Note that opening the Task Manager after starting the game and setting the process CPU affinity from there does not work. We have to get a little more involved than that. One last thing: the following directions are for the singleplayer exe file. If you find you need to apply this fix to multiplayer as well simply repeat the steps for CoD2MP_s.exe. Download imagecfg and extract it into the installation folder. Make a backup copy of your CoD2SP_s.exe since we are going to be altering it. Open a cmd window and move to the installation folder. Enter this command: imagecfg -u CoD2SP_s.exe. If it worked you should see a little report saying the affinity has been set to a single processor. The -u switch makes the application only run in uni-processor mode. On some systems the game won't start on Windows Vista, 7 or higher. Enable the following compatibility settings for the CoD2SP_s.exe and CoD2MP_s.exe files: Compatibility mode (Windows XP (Service Pack 3)). 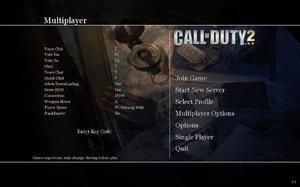 Run the game (CoD2SP_s.exe for Singleplayer, CoD2MP_s.exe for Multiplayer). Because running in compatibility settings give DirectX some unnecessary flags, in game fps can be highly reduced on some systems. Get the Compatibility Toolkit from this Microsoft page and install. Run the Compatibility Administrator (32-bit). Select New Database (1) and press Fix. Fill in the vendor name and the program name, as well as the location of the program. Press next. Tick Compatibility Mode and choose Windows XP SP3. Press next. Untick fix DXMaximizedWindowedMode. It will give a warning, press yes to continue. Select fix DXPrimaryEmulation, click Parameters, enter: -DisableMaxWindowedMode and press OK.
Press Next. After that press Finish. Press Save, select the database name and save it to a location. Because it will conflict with what we removed, you should now revert the compatibility fix you did to CoD2SP_s.exe and CoD2MP_s.exe above. 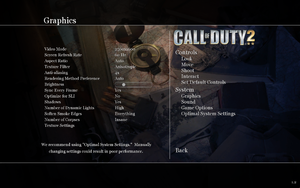 In the graphics option menu, set the "Rendering Method Preference" to DirectX 9. If the game crashes when trying to change the renderer, either modify the game's configuration file manually with a text editor or apply compatibility settings (see Game won't start on Windows Vista and 7 for details). Another workaround is to start a new game and then change graphics settings from there. Copy the Steam.dll file and paste it into <path-to-game>. A mod which adds new sounds, textures and more. To change fov in singpleplayer open CoD2SP_s.exe (v1.2 latest) with a hex editor such as HxD. Goto address 000A11A0 and change A0 42 (which is 80) to B4 42 for cg_fov 90. To do the same in multiplayer open CoD2MP_s.exe (v1.3 latest) with a hex editor such as HxD. Goto address 000BDF00 and change A0 42 (which is 80) to B4 42 for cg_fov 90. To get a higher value than 90 use this Floating Point Converter. ai_corpsecount [1-64] Controls the amount of dead bodies on the screen. g_brass 0 Disables the shells flying our of your gun when firing. cg_marks 0 Disables bullet holes and explosion marks. cg_drawFPS 1 Show FPS counter. com_hunkMegs [80-512] More memory and faster loading times (Don't use more than half of your total memory). com_maxFPS Adjust the FPS cap. r_drawsun 0 Disables the "sunblind" effect. r_lodScale [1-4] Selects the rate objects lose detail. ↑ 3.0 3.1 File/folder structure within this directory reflects the path(s) listed for Windows and/or Steam game data (use Wine regedit to access Windows registry paths). Games with Steam Cloud support may store data in ~/.steam/steam/userdata/<user-id>/2630/ in addition to or instead of this directory. The app ID (2630) may differ in some cases. Treat backslashes as forward slashes. See the glossary page for details.